How do you respond when you see a couple of boys running pell-mell down the hallway to get to your classroom? What about horseplay and jostling/wrestling? How do you handle it when kids throw everything from wads of paper (into the trash, from across the room) to pencils, to jackets? One year in my classroom it was broken crayons, one year it was tiny balls of clay being thrown. How do you handle kids who play "tug of war" with the "best" paintbrush, or who play "sword-fighting" with rulers? Do you allow your students to come into your room if they are acting like they are on a playground, loudly talking, laughing and jostling each other? Does all this strike you as disrespectful behavior or "kids being kids?" What are YOUR classroom rules and procedures? The subject of discipline has been debated for a long time, and there are many different theories out there. Every teacher deals with student misbehavior a little bit differently. We all have varying levels of tolerance for noise, horse-play, and off-task behavior. One of the best online classroom management resources I have found is Michael Linsin's smartclassroommanagement.com. This website has hundreds of articles about everything from how to set up a great classroom management plan to how to deal with disrespectful kids. 2. For noise/off-task behavior – write A.R.T. on the board – erase the T if they’re too loud/off task, erase the R if they continue being too loud/off task (that means 5 minutes of Silent Art) and then the A gets erased if misbehavior continues (the rest of the period is Silent Art or the entire class the next day). Here are tons of other good strategies for dealing with too much talking (at every grade level): Help! My Students Are Talking While I'm Talking! & Talking Too Much: What Are Some Effective Strategies To Deal With Chatty Kids? Broken Record: Teacher says, “Linda Sue, clean up your area.” Linda Sue says, “In a minute.” Teacher says, “Clean up your area.” Linda Sue says, “In a minute! Sheesh, you’re not my mother!” Teacher says, “Clean up your area.” The teacher does not engage in an argument, s/he simply repeats the instruction over and over. Silent stare; “It wasn’t me! It was her!” The teacher just looks at the student, waiting for compliance. The student continues, “Why are you picking on me? I wasn’t doing anything wrong!” The teacher continues to just look at the student who has no one to argue with, so the student has no choice but to sheepishly comply (idea from Fred Jones). 5. Seating charts are a very, very good thing in middle school. 6. Teacher proximity cuts behavior problems way down and encourages students to participate in discussions. 7. Redirection techniques in middle school; go to artfulartsyamy.com for a comprehensive list: "Classroom Management in the Art room: When You Need Help." Rules exist to protect students and their right to learn. In a chaotic environment, little to no learning can take place. We hold students accountable because we care about them, not because we are "power hungry." This article at www.theartofed.com, Think First Before You Punish, is about the brain research of John Medina. The article outlines simple, compassionate ways for teachers to enforce consequences. Doug Lemov says that teachers need to decide whether a student is acting up due to ignorance or rebellion; if we punish a student who just didn’t know better we are teaching “learned helplessness.” Also, if we re-teach a rebellious student instead of providing a consequence, we are abdicating our authority and showing all our students that they can challenge us at any time. Discipline Assignments: writing essays about respect/good behavior, writing sentences, filling out a “Think-Sheet” - I could not find any empirical evidence showing that this is harmful and my administration allows teachers to use this as a consequence. However, many in education are of the opinion that this discourages young people from enjoying the art of writing. I disagree. Official write-ups that get turned in to administration, etc. If your administration knows you have an awesome classroom management plan, they will be much more willing to back you up when you need it. Ask for help if you have tried everything you know to do and a student is still acting up. We are all part of a team and a community, after all! There is no shame in seeking answers and I have many times asked other teachers, the counselors, administrators and the coaches for insights into managing particular students. Always follow the school policy when disciplining students – use discretion and don’t get on your principal’s bad side by going against policy! At the same time, be flexible and discipline in love and kindness because you just never know what someone is going through. You don’t have to be a mean snake to follow through with your discipline plan. Rarely do I need to raise my voice and most of the time I discipline with a VERY soft voice. ......I refuse to get into an argument with a student. ......Understand that middle school kids WILL test you and do their darned best to control your classroom. Have seating charts, rules about talking out in group discussions and re-teach the kids often. ......"Seek first to understand, then to be understood" – Steven Covey, The 7 Habits of Highly Effective People. Do opinion surveys, pre-knowledge questionnaires, multiple intelligence surveys, find out as much as possible about your kids. Who are your kinesthetic learners? Auditory learners? Visual learners? For more information on this topic from a variety of resources, check out the article, Power Stealers. *Classroom management expert Doug Lemov says that the most important thing we need to do before disciplining a student is to decide whether the misbehavior came from a lack of understanding or from defiance. Do we need to re-teach the student or do we need to provide a consequence? From: Teach Like a Champion, by Doug Lemov (Ch. 6, Setting and Maintaining High Behavioral Expectations): (bold, italics, underlining mine). You should "....distinguish between incompetence and defiance by making your commands specific enough that they can't be deliberately misinterpreted and helpful enough that they explain away any gray areas. However, it's worth considering a bit more the capacity to distinguish between incompetence and defiance. If I ask John to pay attention or sit up or get on task and he doesn't, knowing whether he will not or cannot matters deeply. .....If the issue is incompetence, my obligation is to teach John. If I punish him for not complying when he is unable to do so, the consequence will seem unjust: I will punish him for what he doesn't understand or can't do. This will erode my relationship with John and teach him that consequences are disconnected from his actions......Psychological studies suggest that learned helplessness - the process of giving up because you believe your own choices and actions are irrelevant - generally results from a perception that consequences are random. But if John will not do what I ask, the issue is defiance, and my obligation is to provide a consequence. Unless I act clearly and decisively in the face of a challenge to my authority, John will establish a precedent of impunity. He and his classmates will now know that John, and arguably anyone else who's willing to, can successfully challenge me for the rest of the year. When I let go of my authority in this way, I am abdicating my responsibility to protect the environment in which the rest of the students live and learn - and thus their right to a quality education. If I respond to defiance with teaching, I am just as bad off as if I respond to incompetence with punishment. " "Teachers who make decisions based on feeling sorry for students and their sometimes-awful circumstances can cause behavior to worsen. The most compassionate thing you can do for a difficult student is to hold him or her accountable." I think we have a special classroom management challenge in the art room because we allow more students more freedom than they have in other classes, yet we still have limits. 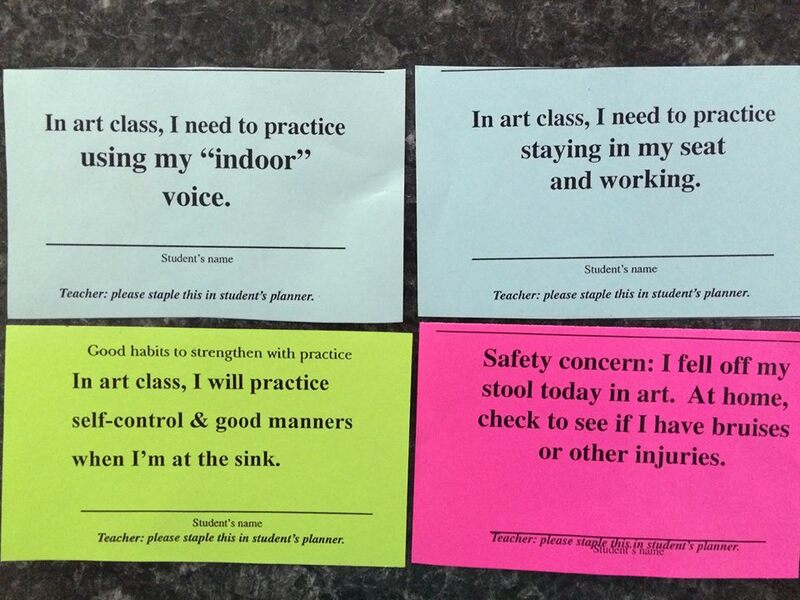 Students test us to find out what the art room limits are. Lucky for me I am in a nice, suburban district with great parental and administrative support. Still, kids forget their manners. My classroom management issues here at are things like horseplay, chatting while I am giving instructions to the class, and roaming the art room socializing instead of working on art projects. • The Book: I keep a binder for write-up sheets. Writing up someone early in the school year or early in a project. I do it in front of everybody as a warning to them all. For example, right after a discussion of ruler safety do’s and don’ts someone starts waving his ruler around in the air. I write him up and there are very few ruler issues in that class after that. I just wanted to add a resource that we all need to know about. The Art of Education offers online Professional Development JUST for art teachers. One of the classes they offer is Managing the Art Room and it is awesome! I taught it for the first time this fall and I learned SO much.....and I've been teaching for 17 years! Anyway, just a good resource, not just for classes, but for articles and art teacher info. Setting clear expectations of assignments are important, but also general classroom behavior also needs clear expectations. Setting routines is also a major factor in classroom management. How can we expect of students to be consistent if we ourselves are not? I’ve been teaching for 29 years at (a Shelby County high school). I began teaching by myself for years, and now we have increased the program to 5 art teachers which I never thought would happen! My principal finally realized that students were interested and that we needed to offer more classes. As I mentioned previously, I do not have a strong personality. I am more of a softie when it comes to discipline. However, I have always talked to my students at the beginning of the year about behavior, rules, having respect for each other, etc. I try to treat them like high school students if they do what I ask of them. This has always worked well for me and I have very few discipline issues. When I do have an issue I try to talk with the student one on one, before writing up a discipline form or taking them to the office. Over the years this has worked for me-but I am at a good school with good students for the most part. A few years ago, I did have the Art 1 class from hell at the end of the day, that just about did me in! I had to put them in assigned seats, use a discipline contract, etc. to whip them into shape! I hated doing all of this-but it did work. I prefer to be more laid back. This is just the nature of being an art teacher. 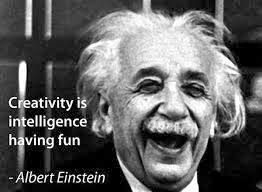 When you involve creativity and production work there are going to be issues period. Consistency is key. If you say you are going to do something, Do it. Routine is imperative with ANY age. As cheesy as the cutesy rhymes are, do them…all the way up to high school. Have specific rules to when students and how many can get out of their chairs. I have a behavior binder. I threaten them with it and totally mean it. I WILL CALL PARENTS….they will test you on this. After one phone call I usually never have to call again. Word spreads quickly amongst the students you mean business. 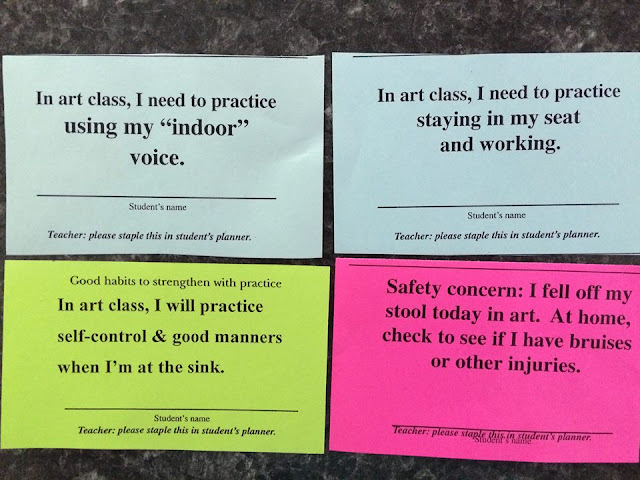 Have specific punishments set in your room when students act up. They want to be with you, it’s usually one of their more fun classes. Take away 5 minutes of art time and it’s the end of the world in elementary school. Middle and high school, ladies and gentlemen…isolation is torture. Have a desk that sits alone. Classroom Management! I have taught for over 25 years and my key to the “Magic” is always in the relationships I build thru trust with my students and mercy and grace. My classroom is based upon RESPECT and KINDNESS. Every week they get a dose of a Character ED lesson with a project attached interdisciplinary of sorts we could say. They have to write reflectively upon quotes and positive character statements with a weekly theme. Also, humor! My students love my expression of care and compassion for them. I take students out of the setting when things occur and we talk one on one building peace treaties and agreements with each other and other students creating a plan of action. An example of an Art Lesson based upon character and history: Peace Doves from heavy poster board. Design a template. Students trace and cut. Set up paint centers with lavender, blues, whites blending beautifully with acrylic. We have used some of the metallic paint but I prefer the other. We paint a stylized beautiful eye lash. We glitter by creating with a motif design with glue and then glittering. We hang these down a hallway making a statement from the ceiling. We discuss Peace Treaty Concepts and discuss examples of Peace Treaties in history. Students then write a peace treaty pertaining to their personal life. We roll these up and tie with a ribbon and staple in the doves beak with a floral motif similar to an olive branch. We discuss art communication and how an image or “Picture Speaks a Thousand Words”. When we see a dove what comes to our mind? The best advice that I could provide to a new art teacher is to establish class procedures, course requirements, and have a documentation system at the beginning of the year. Test students on procedures and requirements and make them retake the test until they get an "A." Hold students to procedures and requirements throughout the year. Don't wait to make documentations if there are issues with students' grades or behavior. View students' grades in other classes, and look for any behavioral or academic problems that are also occuring in other classes if there are issues in your class. Schedule a conference that includes the other teachers, the child, the parents, and the guidance councilor, to correct any issues that are occuring and make a plan that centers around the student's success way before the situation could get out of control. There is strength in numbers when making the student and parents see that the student needs to be corrected. Make measurable plans for correcting the student's performance at the conference and have a plan of action if the goals are not met. DOCUMENT, DOCUMENT, DOCUMENT!!! A teacher asked me the other day, "How do you handle it when an ENTIRE group won't behave?" I had a 7th grade class like that 2 years ago that drove me to distraction. There were probably 5 or 6 boys in that class who somehow made it their mission to talk back to me every day and complain about every last thing we did. The rest of the class wasn't much better, and would talk while I was teaching, laughing and doing the whole, "non-verbal" communication thing during the lesson. I had to literally take away the coat hanger wire from them because they wouldn’t listen to my instructions. I had a student who could not even come into my classroom without being so disruptive I had to put him in the hallway (at that time it was still allowed). Then, he would jump and dance in front of the classroom window to entertain everyone. He was eventually sent to alternative school because of his antics with other teachers. It wasn’t just my class. Another student started what I like to call, “crayon wars” and his group of buddies would stock-pile broken crayons to use as missiles when my back was turned. Trust me, I tried EVERYTHING I could think of - I called parents, I tried positive reinforcement, I took away privileges, I was VERY firm. That group was a headache for months, until I announced that we would be going on a field trip and only those students who behaved and passed the class would attend. ALL the students in that class got to go on the field trip because they just made up their minds they would behave! (They behaved the rest of the year – go figure!) It’s not YOU, it’s THEM! This morning one of our finest 7th grade teachers (former winner of Teacher of the Year) told me of a challenging group (mostly boys) she has this year. After trying everything she knew to deal with their disruptive behavior, she finally tried a "last ditch" strategy and just put all the misbehaving boys at the same table. When one of them said, "Why do I have to sit with all these bad people?" the teacher answered, "Well, when you were spread out in the classroom you were bothering everyone, now you can just bother each other!" and she proceeded to ignore them completely. One day one boy got up without permission, loudly stomped over to the trash can and noisily crumpled up a piece of paper (looking at the teacher to see what she would do)and slammed it into the trash can. The boys also rapped, and drummed on the table, but she ignored them until they began seeking positive attention by raising their hands, answering questions, and behaving. Eventually, each of the boys was able to be assimilated back into the group, one at a time, because they decided to behave. This teacher learned when to ignore bad behavior, which is something Fred Jones tells teachers is a bad idea because, in his opinion, the kids are being allowed to get away with being disruptive, which has a snowball effect on the rest of the class. In my opinion, there is definitely a time and a place to just ignore it! If we spend too much time focusing on the bad behavior, it is like feeding a beast. "Don't feed the bear!" Horseplay is less of a problem (in high school) than compared to middle school. A conversation about childish actions in a high school classroom usually corrects the behavior. I always end the conversation with the explanation that if this behavior continues, we now have a defiance issue, not a horseplay issue. Middle School: If the behavior is outside the room I do not allow them in my room until they are visibly calm and listening to me. As far as in the classroom goes, I would treat it very similar to how I treat high school students. I found it very helpful to have the conversation away from anyone with whom they might want to “show-off”. Since defiance is a “class 2” infraction in Jefferson County, continued behavior in opposition to a specific directive is easy to document. In middle school, horseplay is almost an every day event. The energy level of the kids flows up and down depending on the time of year, so I have to deal with rough-housing a LOT more right before holidays, at the beginning of the year, and at the end of the year. Usually I will have the student "do it over" if the behavior is minor. For example, if I see kids running, usually I will have them go back down to the end of the hallway and do it again, this time walking. I do not allow them into my classroom until they are calm and quiet. Sometimes I will have individuals or groups go back out into the hallway and come in to the classroom again, calmly and quietly. I have been known to make them do it 3 or 4 times in a row if they continue to behave boisterously. When they throw trash, they pick up all the trash in the room. If the behavior is more severe, such as hitting or throwing art supplies at one another, thus breaking my classroom rule that says, "Keep hands, feet, and all objects to yourself," there will be a consequence. I just had an incident two months or so ago involving a couple of 7th grade boys. One boy punched the other in the groin in playful retaliation for being elbowed in the groin earlier in the day. The poor kid was on the floor, crying. When he calmed down, I spoke with both boys in private, they admitted to it, apologized, and then signed their discipline referral form. I had to turn that one in to an administrator! What are these kids thinking, anyway? I've been teaching 7th and 8th grade Art for almost 15 years now, along with English and History. I have no problem with English and History classes but I have to say that there are always one or two grade 8 classes in the art room that present a behavioural challenge. I refuse to believe that the fault lies solely in my teaching style! My entire focus is on projects that will appeal to the kids and for the most part, it works. 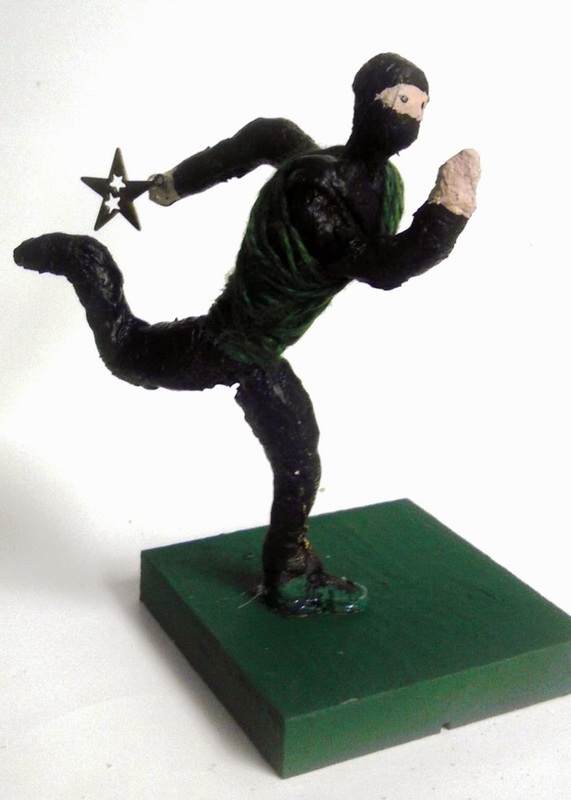 I give up 2 lunch hours a week to run a very popular art club which creates rapport with many of them as well. Despite this, interrupting, arriving late for class, abusing materials, and overall rudeness continues to occur with a select few every year and with 32 at a time I cannot always determine who the culprits are. It wears me down and spoils the experience for the other kids -- whether through my attempts to regain focus or the negative behaviours themselves. My style is probably too friendly and too approachable but that's my personality. Often, I am forced to become super witch at times and it never works! It becomes a battle of them against me. Detentions are difficult on rotary when you don't have the kids at the end of the day, so consequences are always a challenge to think up...I have rules clearly stated and these are always reviewed. A seating plan has to be repeatedly enforced because the social element at this age means that too many kids will sit at one table with no room. So, while I try to look at the half of the glass that is full (aka kids who appreciate art and behave well) sadly, the uncooperative element is rapidly wearing me out! I am sorry but strategies mentioned here and suggested are not necessarily applicable to an art room situation where kids are moving around to get materials etc.. Thank you so much for telling your story! It sounds like you are the kind of teacher I would have loved in middle school and that you really enjoy teaching art! First of all, let me say that it is not you, it is them - it is not your fault that the 8th graders choose to be rude, misuse materials, come in late, interrupt, etc. Don't take it personally! Stay calm and issue a consequence each and every time one of them decides to break a rule - I suggest you also post your consequences alongside your rules. The rules and consequences exist to protect the students and their right to learn, after all, and if a student will not respect your rules that student does not need to have the same privileges as everyone else. Do you have an isolation table or can you separate out the troublemakers? Do you have a set of art textbooks they can work in instead of using the materials? Finally, if there are issues with students moving around the room, stop letting them. Have materials already at the tables or have trustworthy students pass them out after your lesson. I definitely hear you when you say it feels like a battle between you and "them" - I have felt that way many times. This will be my 11th year teaching middle school art and it is very discouraging when the kids don't appreciate all your hard work or the opportunity to participate in art. Less than 1/2 the schools in our country even offer art! Please let me know how things are going, I am sorry it has taken a few days to respond to your comment. I wish you the best of luck! I know comments are a couple years old, I appreciate the advice. I have been teaching art for 11 years and this year is my most challenging yet. An 8th grade class at one school, 7th at another. Yikes! However, it is the 7th grade class that has me frazzled after my second time seeing them this year. I do have art textbooks available, I never thought of having them do a lesson from there. I am working on a behavior contract of sorts. I've already been accused of "singling" out a student by his mother. The entire class will go over rules (again) and consequences and sign a contract basically stating that they understand the school behavior rubric... I was having trouble coming up with "specific to art" consequences. I gathered some good advice here. Thank you! Sure! What information are you looking for?